This is a "Christmas party dance" from December 1938 in London. It was described as "the ideal 'romp' for the Christmas Party, where even 'Competition Fans' like for a few moments to forget all about sways and C.B.M." It was choreographed by Gracie Fields and Victor Silvester to the tune "The Trek Song," which Fields sang in the film "We're Going to Be Rich" earlier that year. Side-by-side facing LOD, Follows on the right, with linked elbows. Figure I - Trek and Turn (8 bars): Walk five steps along LOD, crossing the stepping foot over in front each time (1, 2, 3, 4, 5). On fifth step, cross well over, then twist in place to unwind, Lead rotating CW and Follow CCW (6, 7, 8). Repeat, starting on the other foot, which means that Lead will now twist CCW, and the Follow CW (9, 10, 11, 12, 13, 14, 15, 16). Figure II - Heel and Grapevine (6 bars): Point left heel to side (1), then cross left foot behind right (2), step side right (and), and cross left in front of right (3). Repeat opposite (4, 5, and, 6). Repeat the whole thing (7, 8, and, 9, 10, 11, and, 12). The Follow dances opposite. * Partners cross into each other's places with the grapevine steps, the Lead passing behind the Follow. * In the film of Fields and Silvester dancing it, Fields adds a clap on the second count of the slow heel point (the held count between the start of the heel point and the cross behind). Silvester does not. No clap is specified in the written description, but it adds a fun degree of difficulty to the dance. Figure III - Underarm Turn (2 bars): The Lead closes his left to right and waits as he gives the Follow an outside underarm turn with inside hands (his right to her left). For the turn, she crosses right foot over in front and twists CCW to unwind (13, 14, 15). On the last two quick counts, clap own hands (and), then partner's hands (16). * While the original description specifies that the dance is repeated, in the film of Fields and Silvester dancing it, the dance described above is followed by 16 bars of polka. "The Trek Song" by Harry Parr-Davies. The description of the dance specifies 46 measures per minute. Fields' version is 56 measures per minute, which is too fast to do the grapevines comfortably. The Band Waggoners' version from the same year is just the right tempo, and adds a lovely swingy quality to the dance. Gracie Fields and Victor Silvester. (1938, December). "A Christmas Party Dance, The Trek." The Dancing Times. London. 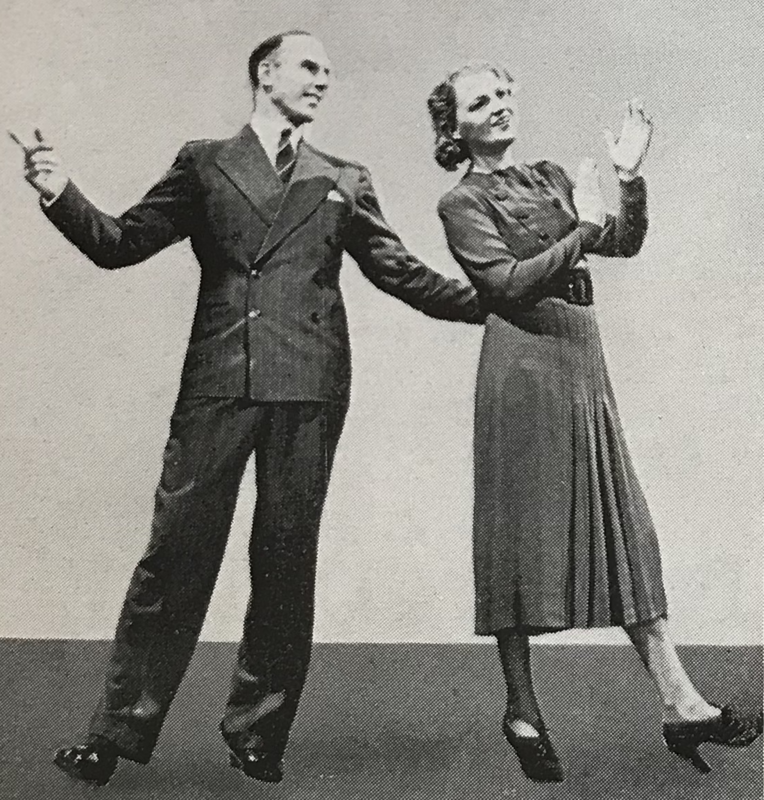 Gracie Fields and Victor Silvester (dancing). (1938, December). Movietone Newsreel, Christmas Edition. London.